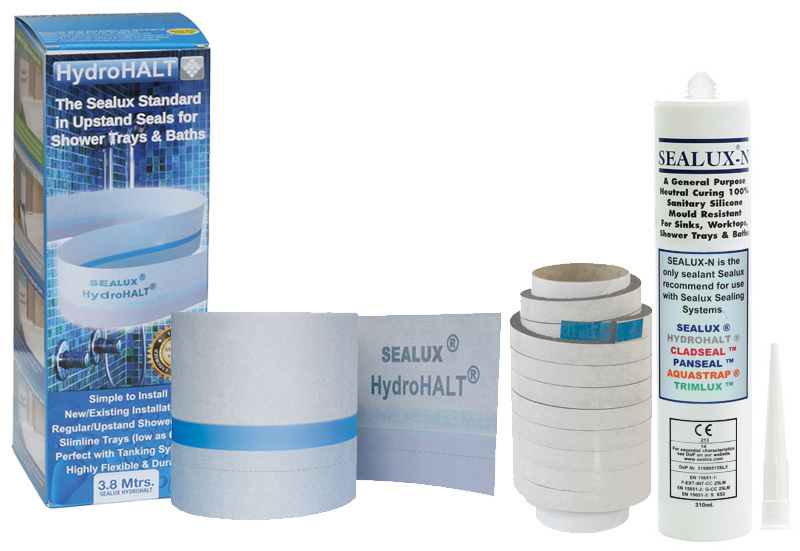 HydroHALT is an advanced upstand seal for shower trays and baths that is higher performing and more versatile than ‘stick-on’ butyl adhesive strips. The HydroHALT upstand is a soft polypropylene (PP) strip measuring 100mm wide x 200 microns thick. Layers of non-woven hydrophobic fleece are laminated onto the strip outside face (facing wall) and upper inside strip face (facing ledge) respectively to allow mechanical adhesion with sealant adhesives, tile adhesives and waterproofing materials. 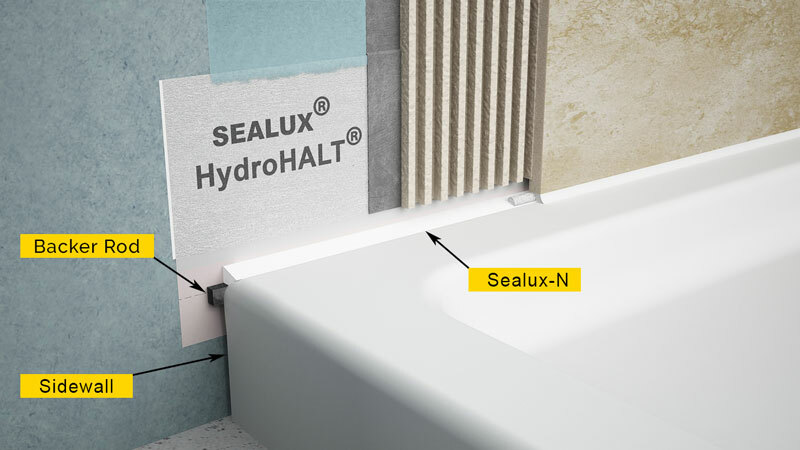 The HydroHALT strip has a fleece free strip extending adjacently to the tray/bath sidewall that is treated to accommodate tenacious adhesion with Sealux-N when applied into the joint formed between the HydroHALT strip and the adjacent shower tray/bath side wall or ledge during installation of the tray or bath as detailed in the above drawing. HydroHALT combines a polypropylene fleeced membrane with a sealant backer rod and Sealux-N silicone. The strip is bonded to the wall, the backer rod is bonded to the tray/bath sidewall and the joint sealed with Sealux-N. The HydroHALT strip is treated to achieve tenacious adhesion with Sealux-N. When joint expansion occurs between the ledge and wall, deflection in the HydroHALT strip and deformation of the Sealux-N bridge connecting the strip to the tray sidewall accommodates this joint movement (see video below). Strip Length 2 – 50 Mtrs.